You are here: Home / User guide / User manual / Corpora / Which corpus to use? A corpus has to be selected before you can start using any of the Sketch Engine features. If you are a new user, it might not be clear which corpus you should be using. Here are a few tips for beginner users. Featured corpora are a good start for monolingual corpora. These have been pre-selected based on the size and the availability of maximum number of features. 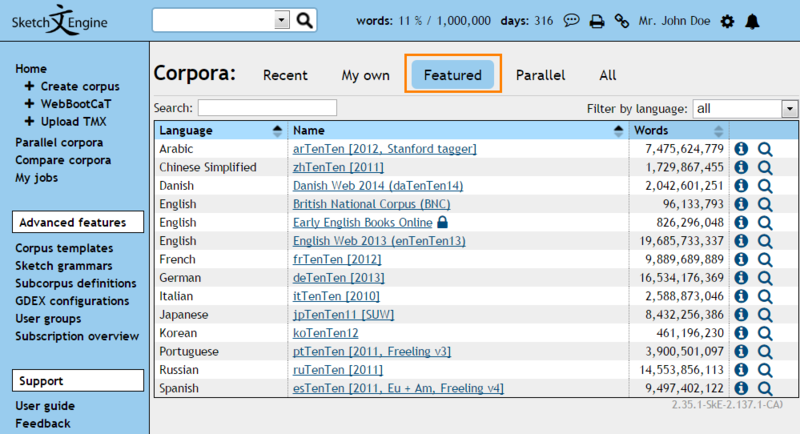 If there is no featured corpus in your language, switch to All and use the drop-down to select the language and pick the largest corpus. Detailed corpus information can be displayed by clicking the (i) info buttnon next to each corpus. For a complete list of corpora, refer to the list of corpora.